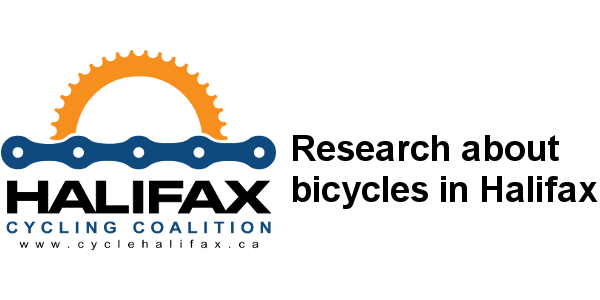 This page contains various research conducted by the Halifax Cycling Coalition, including student reports, internal research, briefing documents, and more. We will add research here as we create it. Note that this is not a comprehensive archive, but we aim to make as much information available here as possible. What mode of transportation did you use to get here? Do you think a protected bike lane on this street would be beneficial? More than 20 volunteers helped to collect more than 900 survey responses. The survey was designed in partnership with the Dalhousie Transportation Collaboratory (Dal TRAC). Stay tuned for results and for more surveys to be conducted in the future. The HCC played a role in the Establishing a Baseline research by being a member of the Active Transportation and Health Indicators Working Group and providing data for the report. The Halifax Cycling Coalition has several Eco-Counters located throughout the Halifax peninsula, usually on streets where protected bike lanes or local street bikeways are proposed in HRM’s Integrated Mobility Plan. Eco-Counters are devices that connect to tubes that are laid in the street, which count each bicycle that passes over the tubes. The data is made publically available on a website and the daily totals are tweeted at @bikehfxstats on Twitter. We are currently gathering baseline data, with the intention of counting the number of people riding bikes on key streets after protected bike lanes have been implemented. Travis Fong completed the following research on bicycle share during the summer of 2015 as part of his Bachelor of Environmental Science and Sustainability at Dalhousie University. He concluded that the bicycle share would attract 1,500 annual members and 6,000 day users, and would require a capital investment of $1,500,000 and an ongoing operational subsidy of $86,000 per year. Click here to view the full report. In January 2015 we released our landmark On Track for 2020 research. This report outlined the potential for protected bicycle lanes on the Halifax Peninsula and in Downtown Dartmouth, outlining a pilot network of 37km of protected bicycle lanes costing $1,500,000, and calls for the city to add 63km of traffic-calmed residential streets. Download a copy now. Many of the HCC’s recommendations from On Track 2020 have been incorporated into HRM’s Integrated Mobility Plan, also known as the IMP. The IMP calls for a minimum grid of bike lanes and traffic-calmed residential streets to be implemented by 2022.